Soon Ja Du leaves court with har husband Billy Hong Ki Du. 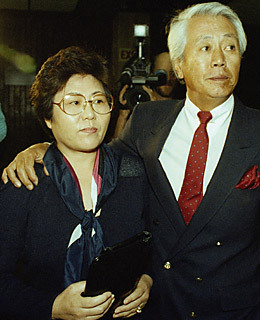 In many ways, the shooting death of 15-year-old Latasha Harlins on March 16, 1991 by convenience store clerk Soon Ja Du, a Korean immigrant, laid the foundation of anger and resentment that would eventually explode after the King verdict. On the afternoon of March 16, 1991, the 15-year-old Harlins entered the the Empire Liquor Market, which was owned by Du's family. Harlins put a $1.79 bottle of orange juice in her bag and, security cameras showed, approached the counter with money in her hand. Du didn't see the money, however, and confronted Harlins over what she saw as an attempted theft. After a brief scuffle, Harlins left the orange juice on the counter and started to leave, only to be shot in the back of the head by Du. Du was convicted of voluntary manslaughter, but her suspended sentence  five years of probation, 400 hours of community service, and a fine  enraged much of L.A.'s black community. Soon Ja Du now lives in the San Fernando Valley.